This tiny flower imparts important lessons: First, it can remind you to maintain modest expectations for how well the general population are likely to receive your best work; when we see how easily people miss, dismiss and deny the full beauty, wonder and value of dandelions (they really are spectacular!). Second, how the dandelion is generally treated in our society can remind you how powerfully determinant conventional thinking can be, and thus, why it is difficult for people to keep an "open bowl" to new and/or different ways (solutions). 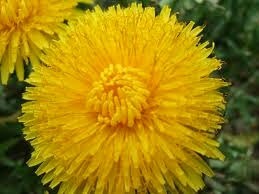 One of the most common and twisted stories (perceptions) of dandelions portrays them as nothing more than a weed---one that merits great expenditures, of energy, time, money, and deadly poisons to destroy and eradicate. This is stunning, in light of the fact that dandelions are a nutritional powerhouse (the entire plant is edible, root and all; and it can be eaten at any stage of development) and tasty too (it makes good tea, and since my family started eating dandelions we have no more need to grow spinach or lettuce in the garden). My high-glory story is that dandelions are a blessing...sent as a heavenly reminder, to inspire and give us all courage to set sail on the hunt for new, better solutions despite the harsh winds of social disapproval. This flower, to me, is evidence that we need to journey on with a bright hope, that there are other things (many things) in our society and inside ourselves that like the dandelion, are better, healthier, more beautiful, and so much closer to home than we had ever imagined, which can be more easily obtained than the conventional substitutes we currently, conventionally strive for.